Wyclef Jean may not have been eligible to run for Haitian president, but that hasn't stopped him from lying like a true presidential candidate. It was only two days ago that he was claiming he had been shot in the right hand during a rally in Port-au-Prince for presidential candidate Michel "Sweet Mickey" Martelly Saturday night, but now, the doctor that treated his injury is saying his hand was cut by glass. Gerry Andre, Jean's spokesman in Haiti, told the press that as he got out of his car to make a phone call, he heard gun fire and then realized his left hand was bleeding. His publicist in the states, Cindy Tanenbaum, said he only suffered a "superficial wound" and is "doing well." Wyclef stalled the police investigation by refusing to speak with them according to Garry Desrosiers, a spokesman for Haiti national police. Wyclef told the press, "The way I can explain it is that the bullet grazed me in my right hand. I heard blow, blow, blow and I just looked at my hand." 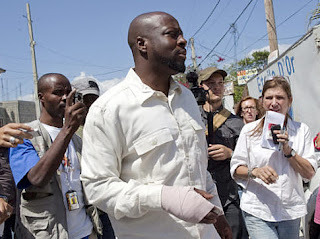 Vanel LaCroix, police chief in Petionville, where Wyclef is staying, told Reuters, "We met with the doctor who saw him and he confirmed Wyclef was cut by glass." This incident is not the first time the 37-year-old hip-hop star and would-be candidate's words have been suspect. Last year, The Smoking Gun (gotta love them) produced evidence that the Internal Revenue Service records show that Wyclef's Haitian charity, Yéle Haiti has a suspicious history of accounting for its finances. The organization has paid Wyclef Jean and his business partner at least $410,000 for rent, production services, and Jean's appearance at a benefit concert. The 2007 tax return for the charity stated that Jean's $100,000 payment for appearance at said benefit concert was "was substantially less than market value," but why did he need to be paid for his own benefit concert? On top of that, Platinum Sound, Wyclef's New York-based recording studio was paid $31,200 for "rent," and again it was noted that this "is priced below market value." Sheisty indeed. In 2006, MK'd Angelina Jolie (talk about overexposure and synchronicity--DirecTV's ads for "the Tourist" came on as I was writing this sentence) directed the first photographs of her pregnant with MK'd Brad Pitt's child, Shiloh, so that People magazine would give $1 million to Jean's charity organization. After the accusations, Wyclef had a press conference, where he fought back tears and denied the allegations, even though records proved them to be true.